Hollywood portrays family drama at holidays when relatives reunite. Multi-generational meals. Amusing misunderstandings. And dysfunctional dynamics. For Italians, this is every Sunday. 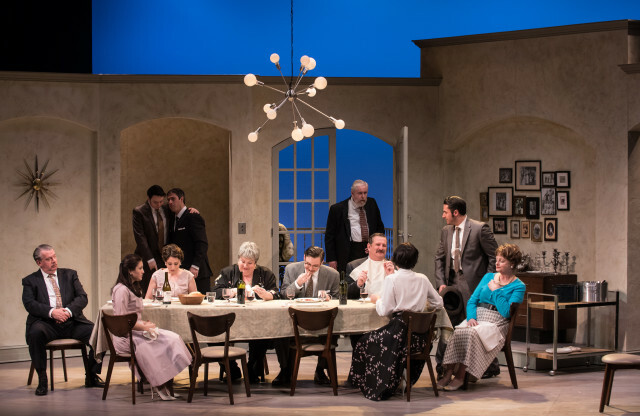 Having grown up in an Italian American family, who ate delicious dinners on Sunday afternoons, I couldn’t wait to see Virginia Repertory’s production of Saturday, Sunday, Monday by one of Italy’s greatest playwrights, Eduardo de Filippo. 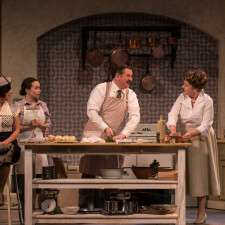 Set in 1950s Naples, it promised entertaining quarrels as ragu simmered on stage. Opening night at Virginia Rep’s November Theatre didn’t disappoint. From the moment audience members take their seats, the multi-sensory experience begins, for behind the red velvet curtain a fully functioning kitchen waits. While Saturday, Sunday, Monday draws on a large cast, it begins with an intimate serenade on guitar by Federico, (played by Max Stampa-Brown). As he croons, you’re transported to the kitchen – the center of life in an Italian family – where cast members wipe away real tears while cutting onions. Over the course of the first act, you meet the comical clan. Virginia, the maid played by Audra Honaker, makes the sign of the cross every time a saint’s name is mentioned. Antonio, the patriarch played by Matthew Costello, insists on “fixing” everyone’s hat and wonders, like my great aunt did, why he’s surrounded by Judases. And Luigi, the animated neighbor played by Joe Pabst, never arrives empty handed. But you don’t need to be Italian to enjoy this play. When the daughter-in-law, played by Lauren Elens, fails at giving Rosa a compliment on her sweater, the retort is reminiscent of the Dowager on Downton Abbey. Anyone who has ever been embroiled in family drama will love it. There’s the charming younger brother, Rocco, played by Mike Labbadia, who’s trying to strike out on his own in business. The emotional sister, Giulianella, played by Noelle Franco, fights with her fiancé. And the jealous father, Peppino, played by Wilbur Edwin Henry, still loves his wife’s vitality after years of marriage. However, Aunt Meme, played by Catherine Shaffner, steals the show. The most authentic performance from this ensemble came from this hysterical, fast-talking, overbearing mother, who made my 13-year-old daughter wish we were back in Italy. But just as it’s the secret to a good ragu recipe, time and attention is all this, or any, family needs. Saturday, Sunday, Monday is a great play for RVA families with teenage children especially. For while parents of all ages do what they do out of love, everyone likes their efforts to be recognized. I have no doubt your children will not only thank you when it’s over, but you will also have a strong desire to call your mother to share your gratitude. Italian or not. I know I did. Saturday, Sunday, Monday runs through March 6 at Virginia Rep’s November Theatre. Click here for showtime and tickets, including an array of discount opportunities for seniors, students, teachers, and groups.